For all of you almond butter lovers out there, I highly recommend these Oven Roasted Blue Diamond Almonds. 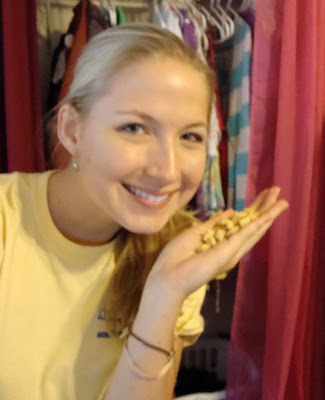 From my experience in the past, normally packaged almonds, peanuts, or cashews are VERY salty. To my surprise, these Sea Salt Almonds contained the perfect combination of subtle, yet delicious flavors. Package them in a small Ziploc bag for an afternoon energy booster while sitting in class or even the office. Lemon Tilapia with Baked Apricots one night with a fresh side salad. Hi friends, I hope you all had a great weekend. Tonight, I took my first Entrepreneurship exam and it went really well. Overall, I'm very excited about my classes this semester. It seems as though more of my teachers are giving tips and tricks of the trade, instead of just presenting material straight from a textbook. As a student, this new teaching method is considerably more engaging. I personally like Activia a lot better than Dannon's Light & Fit Yogurt. What makes Activia different? Activia contains Bifidus Regularis, a special probiotic that helps food pass easier through your intestines. The Dannon website states that: "Eating, as part of a balanced diet and healthy lifestyle, Activia every day for two weeks delivers enough Bifidus Regularis to help regulate your digestive system by helping with slow intestinal transit." Parmesan Crusted Chicken with honey mustard and side salad. This time, I added basil to the Parmesan cheese mixture and it tasted ten times better. Isn't it crazy flavor-wise what herbs can add to a meal? Two simple steps: Build your burger and then enjoy! Compared to McDonald's 540 Calorie Big Mac, this burger is definitely a healthier bet. 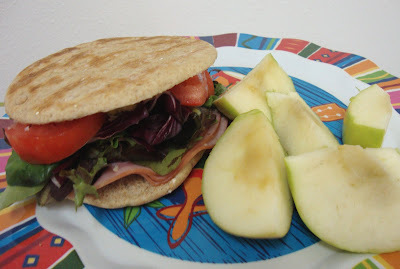 Arnold Select Sandwich Thins Review: After eating way too many wraps this past week, I decided to mix things up and try Arnold Select Sandwich Thins. I'm so used to using basic, fluffy hamburger buns, that I have to admit, I was somewhat hesitant to try these. To my pleasant surprise, Arnold Select Sandwich Thins definitely delivered on the "yum factor." The Multi-Grain roll was hearty, healthy, and topped with little seeds that made it even more appealing. **2009 Foodbuzz Blog Awards Nominations are currently in effect. Nominate your favorite bloggers! 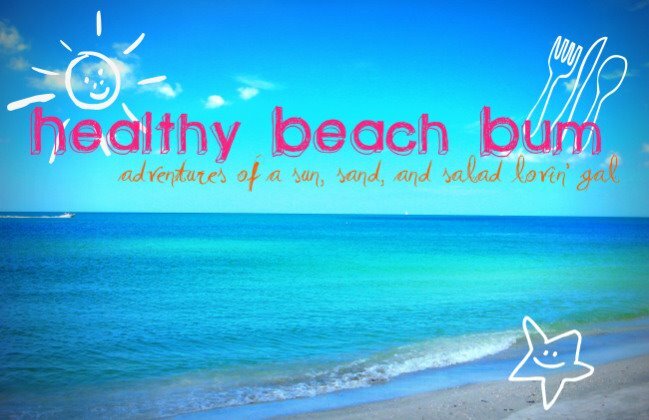 Follow me on Twitter for more Healthy Beach Bum adventures. "Optimism can take you anywhere." Combine all of the ingredients in a bowl. Whip the batter until the protein powder is dissolved. Pour the mixture into a frying pan and cook over medium heat for 3-5 minutes on both sides. 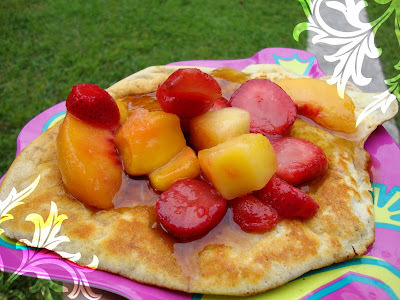 Drizzle on your favorite syrup, add fresh fruit, and enjoy! This White Chocolate Macadamia Nut CLIFBAR is the perfect energy booster and study snack. It packs in an amazing 9g of Protein and is made with all natural and organic ingredients. Besides the Carrot Cake Clifbar, WCMN is by far one of my favorite flavors. 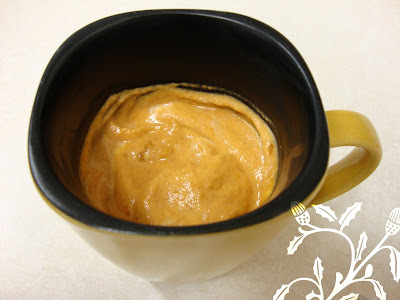 Stonyfield Farm Organic Greek Yogurt mixed with pureed pumpkin, cinnamon, and a dash of sugar. **Thank you so much to Heather for the Giveaway treats! I'll be having my first GIVEAWAY on my 50th post. Get excited! Happy Labor Day friends! I hope you've all had a very eventful weekend. Last night, I was lucky enough to watch the Florida Gators dominate the Charleston Southern Buccaneers in The Swamp. The final score was 62-3. I love being a Florida Gator! Breakfast omelette stuffed with fried ham slices. I also had a delicious granny smith and a side of sliced tomatoes sprinkled with basil and Parmesan cheese. Ok I'll admit it, I am a hazelnut iced coffee-holic. Recently, I went out of my comfort zone to try Yogi Tea: Berry Detox. This particular Yogi Tea was very subtle in flavor. I did add a sprinkle of sugar to liven the tea up a bit. The package stated the Yogi Tea was supposed to cleanse my body, but I honestly couldn't tell if it did or not. ;) Maybe like the flavor, it had a subtle cleansing factor. So far my favorite Yogi tea is the Calming version. **As a side note, I just learned that there is Yogi Cereal. Go on the Yogi website and customize your Yogi cereal based on: Mood, Flavor, Purpose. I chose Revitalized Mood and was paired with the Granola Crisps: Mountain Blueberry Flax. Hopefully I can find this in a local grocery store because it looks delicious! For dinner I made my favorite thirty minute meal: Parmesan Crusted Chicken. Honey mustard was the perfect dipping sauce for these crusted chicken bites. Hello friends. Can you believe it's almost Friday? Time sure does fly when you're having fun (or busy with schoolwork). This week I've been dedicated to giving myself an extra ten minutes to make healthier meals. With a busy college schedule, we can always get thrown off of our nutritious eating plan. If you find there just isn't enough time to exercise, take 10 extra minutes out of your day to make a healthier meal. Hope this tip works for you too! 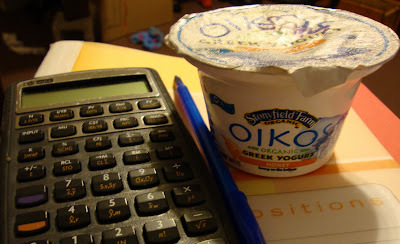 Stonyfield Farm Oikos Organic Greek Yogurt helps me study. :) Honey is my new favorite flavor! Every weekday at school, a group known as the Hare Krishnas, serve an amazing lunch in the courtyard. The Krishna lunch is mainly known for its almond salad dressing-- which is the best thing you will EVER taste. Click this link for the recipe. Tuesday's Krishna lunch: cabbage, potatoes, and broccoli in tomato sauce, brown rice & sesame seeds, salad with almond dressing, and Mounds Bar Halava for dessert. At the grocery store the other day, this Tasty Bite Punjab Eggplant meal popped out at me. Being the food blogger that I am, I decided to give it a whirl. The back of the box states that, "Punjab Eggplant is made using all natural, fresh ingredients hand-picked on our farm." It is also vegetarian, vegan, kosher, gluten free, contains no MSG or preservatives. Another bonus is that it only takes 90 seconds to heat up. Time to read a few chapters for class. Saturday I'll be going to our first football game of the semester. I can't wait to see our Tebow in action! Go Gators! Good evening lovely ladies! Considering it is only Monday, today was a very productive school day. In Sales Management class, my professor touched on a very interesting topic that we as bloggers, are very familiar with: Social Media. Of course, I felt an instant connection with this topic because of what I've learned overtime from BlogSpot, Twitter, Facebook, and Wordpress. Social Media is such an important aspect in business today because it allows otherwise, cold and serious companies to have a more approachable personality. I found this quote on my LinkedIn eMarketing Association Network: "Technology is only as good as the soul behind it, I feel. Crafting that soul is where the opportunity lies." The speaker of the quote hit social media dead on the nose. Companies will only find success in social media if they engage their customers, relay their unique corporate culture, and portray trustworthiness to the public. With senior year upon me, I am extremely excited about pursuing my professional career. 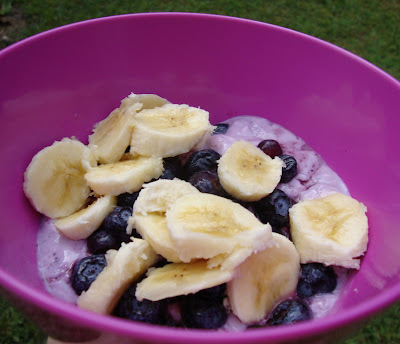 I began food blogging because I have a sincere passion for both nutrition and a healthy lifestyle. Post graduation I hope to work in the Marketing Industry for health food products. My ultimate goal would be to work for a company such as Stonyfield Farm, Kashi, Kraft, or General Mills. Each of those companies place their customers on such a high pedestal and value both nutritious and quality products. Overall, I would love assist in the incredible health food movement. What can I say? I just love being a food blogger! ;) I'm so happy to have met such unique and wonderful people all over the world. Thank you all for following my Healthy Beach Bum adventures. Each and every one of you truly make my day. **Road ID sent me a coupon code for $1 off any Road ID purchase. It can be used up to 20 times in the next 30 days. A sun-loving college girl with a passion for food, fitness, & a healthy lifestyle. Post graduation I hope to work in the Marketing Industry for health food products. I also write health & lifestyle articles for http://collegelifestyles.org. Eat Always, Sleep Seldomly, Run Whenevers!